Despite the yo-yo forecast Saturday was a dream day on Llŷn. 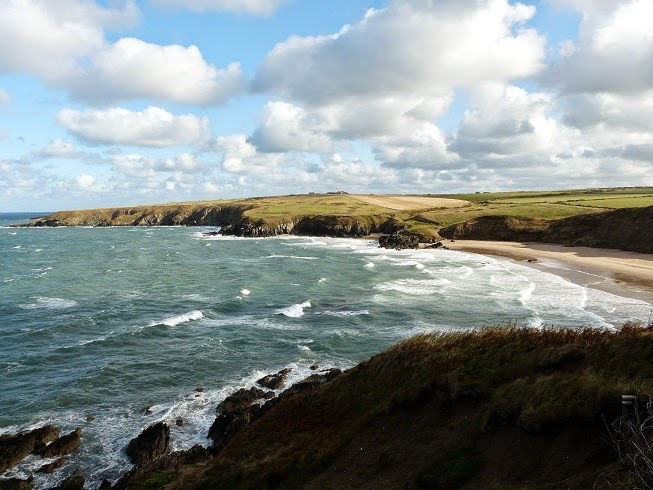 Starting at the northeast end of Porthor (aka Whistling Sands) we walked to the headland at Uwch Mynydd without seeing a soul; lots of white horses from the north and a fast moving sail doing many more knots than us. Sheltered behind the old coastguard building we munched Kurdish pasties from Kurmang, the baker in Blaenau Ffestiniog. Warming and filling - yum. 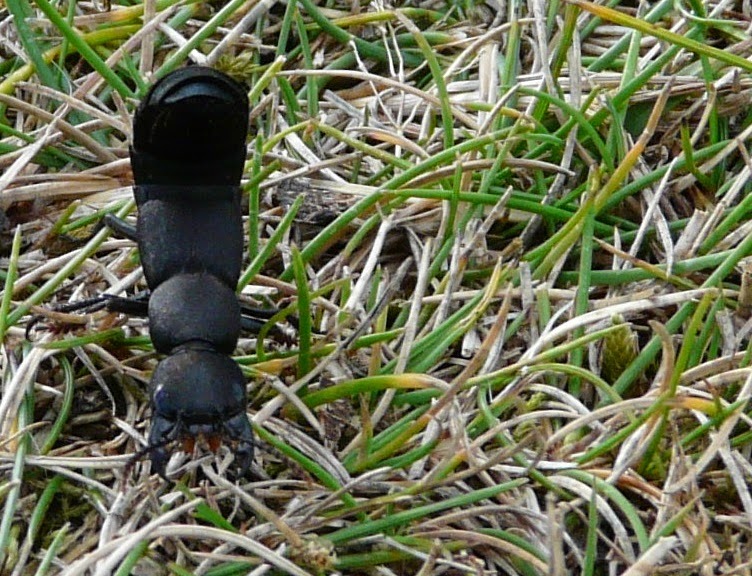 A Devil’s Coach-Horse beetle came to investigate, its tail raised scorpion-like, but we had none to share. From here we could see Parys Mountain near Holyhead and to the south what looked like Pembrokeshire. With binoculars we think we saw the mountains in Ireland. Wicklow? Choughs choughing or chowing galore and gannets swooping over the waves – no chance of spotting dolphins in all that surf. 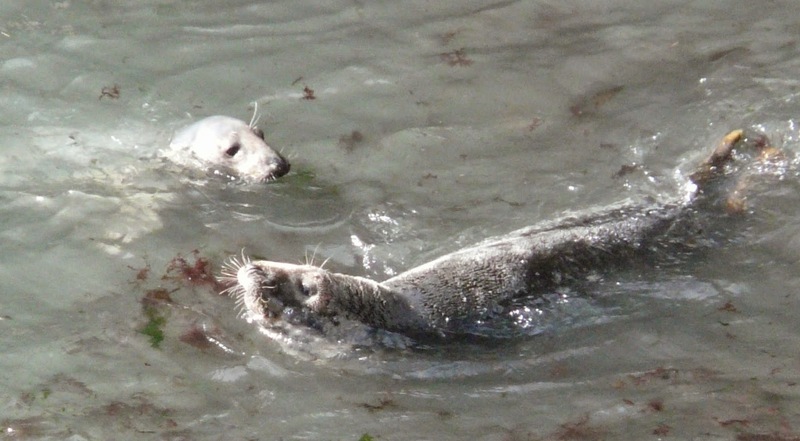 However, in a sheltered cove, a pair of seals; male and female? No sign of a pup but were the plaintive moans her labour pains? Five hours later we made it to the beach at Aberdaron and walked through the waves into the sea; bit of a shock to begin with but a great swim. Dried off at the top of the beach; no wind here, the heat of the sun stored in the sea wall and the sand. Not a goose bump in sight. Tea, Bara Brith and home – memories are made for days like this. 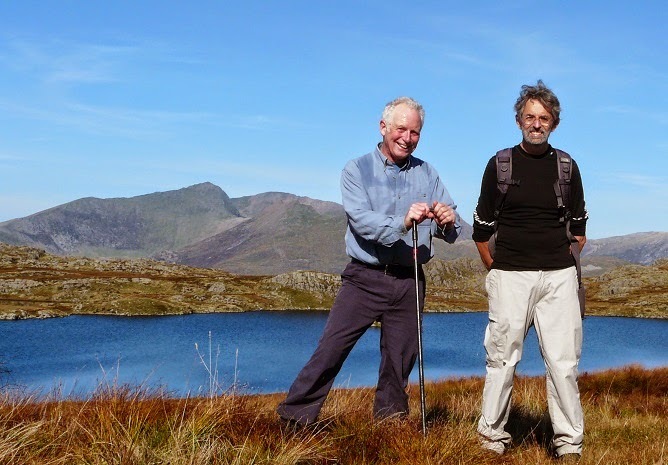 When visitors have travelled so far to enjoy a weekend of Snowdonia walking, I feel duty bound not to disappoint. Something big? Something long? Yesterday it was both. Out of the front door towards Tanygrisiau, steeply to Stwlan then across the plateau to Rhosydd, past Llyn Adar, past Llyn Edno, along a fenced ridge that marks the county boundary and then the assault on Moel Siabod. The views along the way were perfect. As for the return journey we were fortunate to have booked a lift with Sue on her way back from Llandudno. Slightly later than intended we met up at Cobden’s Hotel 7 hours and 20 minutes since we set off. Highly recommended route in good weather. The road from Maentwrog to Blaenau seems to have more than its fair share of accidents; at the weekend an air ambulance helicopter landed in the valley but the motorcyclist was already dead. Today I went to a briefing in the Blaenau library about plans to make it safer and ironically there was another accident on the way home, with an overturned Land Rover - fortunately no-one seriously hurt. Possible improvements start at the Maentwrog end with a right turning lane for the junction at the bottom of the hill as you come down from Trawsfynydd. Other improvement areas are at Rhyd y Sarn, then at the big bend after Rhyd y Sarn, also further up the hill towards the junction with Manod and at Rehau. However, the biggest, potentially most expensive and contentious area is the junction at Tal-y-Bont where our bottom lane crosses the Dol Moch bridge and joins the main road to Blaenau. Six options have been put forward for consideration and these can be seen in the diagram below. 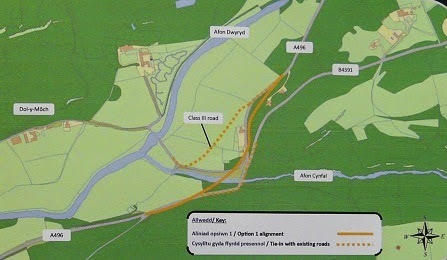 One of the options is to make the bottom lane from near the Oakeley Arms the new main road, connecting at Rhyd y Sarn; an official at the meeting noted my concern and pointed me to the long list of disadvantages and relatively few advantages saying that this was the least likely option. Phew! One of the options is to take the road higher up through the woodland above the Tal-y-Bont junction but this too has many disadvantages and is unlikely. The frontrunner from a casual glance looks to be the building of a new bridge slightly downstream of the current one to reduce the sharpness of the bend. The bottom lane will be diverted just after the Dol Moch bridge to join the main road closer to Rhyd y Sarn and the road down from Llan Ffestiniog will use the old bridge merging with the new section of road further down the valley. 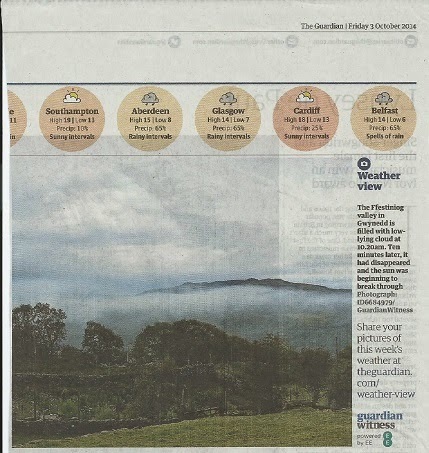 Top of the table of disadvantages is ‘potential impact on the setting of Tal-y-Bont’ - I feel sorry for our good neighbours who live here whose beautiful home will become an island if these proposals go ahead. I am also concerned that if and once these various improvements are implemented the road from Maentwrog to Blaenau will become the new trunk route and the current section from near Traws to Blaenau will be de-trunked. This will mean yet more traffic going up and down steep hills with all its noise and pollution. 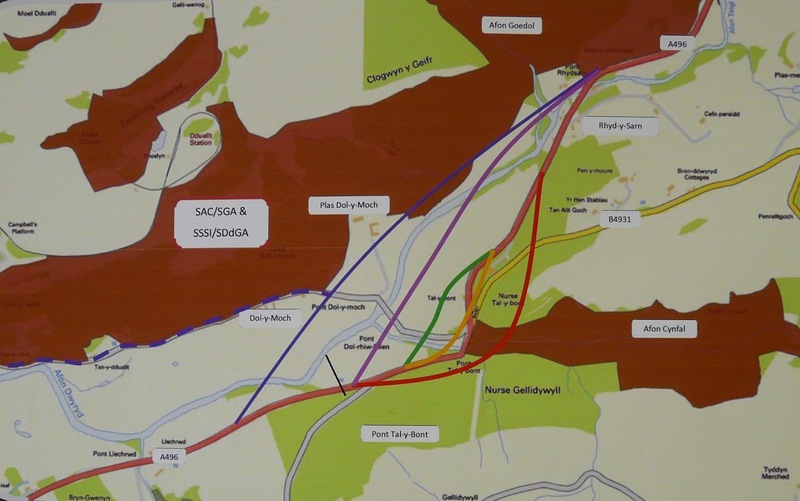 This road improvement investigation has been initiated on account of the Snowdonia Enterprise Zone, which includes sites at Llanbedr Airfield and Trawsfynydd Power Station, and its need for an efficient transport network. With Llanbedr one of eight potential candidates for the UK’s first spaceport, the shaving of a few seconds off the journey from Llandudno could make all the difference to a trip to Mars!